Bring the flavor of caramel apples into your kitchen! 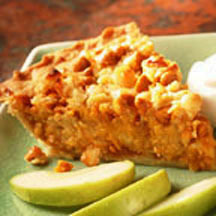 Butterscotch morsels, crisp apples and macadamia nuts turn a simple pie into a caramel delight. Created by Louise Piper, Rolfe, IA.